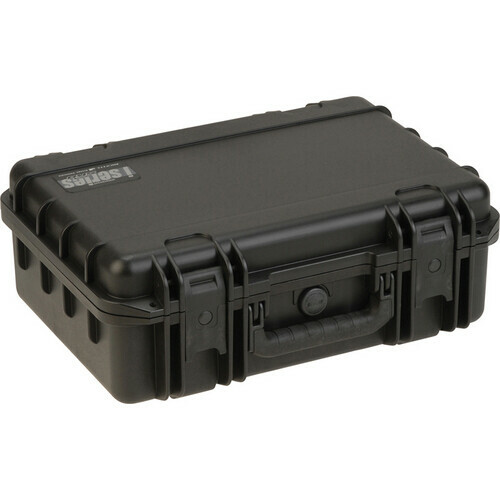 The black Mil-Std Waterproof Case with Custom Interior for Shure SLX/ULX/BLX-R/ULX-D/QLX-D from SKB is the perfect way to transport or store your Shure SLX, ULX, BLX-R, ULX-D, or QLX-D wireless microphone system. This is a hard, durable and extremely reliable case that meets military standards for altitude, weather, and water. The interior foam is rated to hold the Shure's receiver, quarter and half wave antennae, handheld mic, bodypack, lavalier mic, 9V and AA batteries, mic clip, and power supply. This is an injection-molded case that is fully gasketed and submersible due to its polypropylene and copolymer resin construction. The trigger latch system is secure and supported by a cushioned and molded grip handle. As an added benefit, this case is stackable for ease of storage and/or transportation. Another benefit of this case is the built-in pressure-equalization valve. Backed by SKB's Million Mile Lifetime Warranty, you can be sure you can carry, ship, or store your mics in safety with peace of mind. That means, if your case breaks, SKB will either supply replacement parts, repair the case, or replace the case at no cost to you for as long as you own the case. Box Dimensions (LxWxH) 18.5 x 14.5 x 7.5"
Mil-Std Waterproof Case with Custom Interior for Shure SLX/ULX/BLX-R/ULX-D/QLX-D (Black) is rated 4.5 out of 5 by 4. Rated 4 out of 5 by BJ tech from Nice, but needs mod to fit ULX-P Great case, but be aware it does not fit the Shure ULX-P line. It was fairly simply to cut out a little more room on the side to accomodate my ULX-P, so it wasn't a huge problem. The advertising should have been a bit clearer about that, but overall I am satisfied with what I got. The case is built very solid, and the cutouts are nice. Rated 4 out of 5 by Anonymous from Good product Fits components very well, would have liked it to be able to fit the receiver without removing the ant antennas. Overall I am pleased with this purchase. Rated 5 out of 5 by AAV in Minneapolis from Nice Case! Built to carry your wireless system safely and compactly. Lightweight but very sturdy. Should last a very long time. Rated 5 out of 5 by Anonymous from Great Geavy a Duty bag Great bag. Great sevice. Where in the case do the QLXD antennas go?